Give the gift of AAAS membership! AAAS members help us maintain support for science education, innovation, and responsible policy. Each membership helps AAAS educate and communicate with policy makers and bring evidence-based research to bear on critical issues such as climate change, STEM education, and public funding of science research. It’s the perfect gift for the science advocate in your life! When you gift a membership in the American Association for the Advancement of Science, we’ll continue our mission in 2019 to advance science for the benefit of all. Give the gift of membership by April 30, 2019 and we’ll send the recipient a limited-edition AAAS "Get in on the Reaction." T-shirt as a thank you. Please enter your name and email Looking to buy membership for yourself? Offer valid from April 1, 2019 to April 30, 2019 for new individual members only. 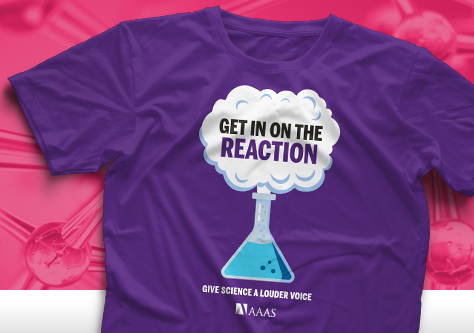 There is a limit of one AAAS "Get in on the Reaction" T-shirt per membership order. Members with an international shipping address and student members who select a digital subscription are not eligible to receive a premium item. Please allow 10-12 weeks for delivery. The AAAS "Get in on the Reaction" T-shirt is provided as is without any guarantees or warranty and cannot be exchanged or returned. In association with the product, AAAS makes no warranties of any kind, either express or implied, including but not limited to warranties of merchantability or fitness for a particular purpose.